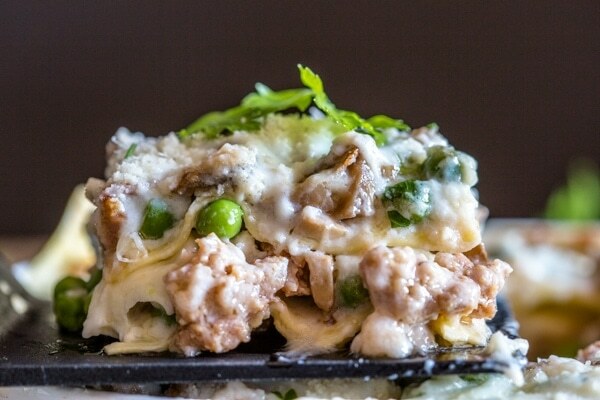 Homemade Creamy White Sauce Lasagna, an easy delicious Italian Lasagna Recipe, layered with peas, sausage, mushrooms and the perfect Bechamel Sauce. It just might become your new favorite Dish. Everyone has eaten Lasagna I’m quite sure. I know I have eaten a lot of pans of Lasagna made by my Mom and my sister’s mother-in-law in Canada. But they were all the traditional Red Sauce Lasagna. Delicious and different in their own way. Some made with eggs, some with ricotta cheese and some with meat. But not everyone has had the good fortune of eating a White Sauce Lasagna (or Lasagna Bianca). This I’m sure will become one of your favourites. Quite rich but oh so delicious. It does take a little bit of extra time, (fortunately there are those oven ready lasagna noodles which makes life easier) and few extra pots, but well worth it. 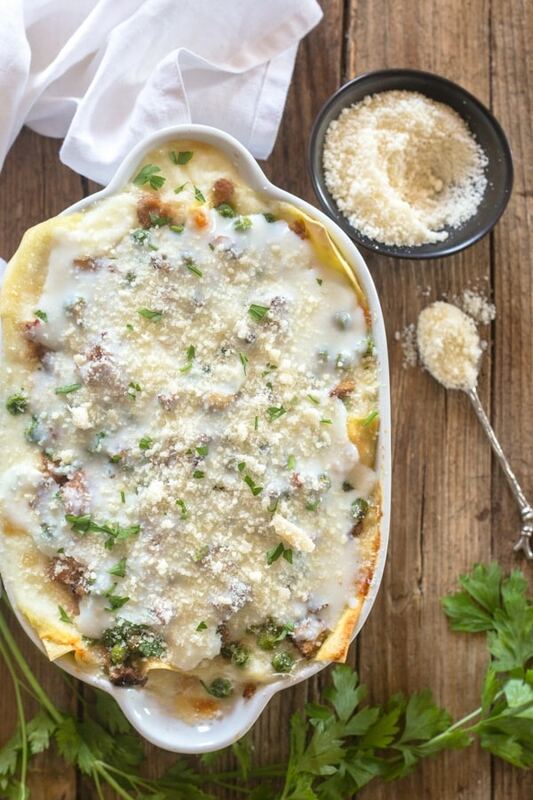 Which makes this Lasagna recipe the perfect Special Occasion Dish. The first White Sauce Lasagna I had ever tasted was made by my sister-in-law. I really didn’t know what to expect. But I knew, that the ingredients of peas, mushrooms, Italian Sausage and a creamy homemade white sauce were everything I loved. On low heat, melt the butter, then add the flour and salt and whisk until smooth. Gradually add the milk, stir constantly until sauce starts to boil and thicken, remove from heat. So just imagine it all in a Lasagna! You know it can’t get much better than that! So needless to say you can certainly bet I got that recipe written down before the evening ended. After living in Italy for a few years I came to realize that there are so many delicious Lasagna Recipes. Every region has their own and every family has their own way of making this Classic Italian Dish. But I am sure after tasting a few of these different types of Lasagna you will decide what your favourite is, or if you are like me, you will have more than one that is your preference. Buon Appetito! 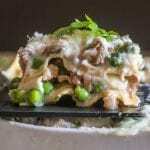 You could always make this into a vegetable lasagna, increase the peas and mushrooms and leave out the Italian sausage. In a small pot of boiling water add peas and cook until tender about 10 minutes, and drain. Cook sausage in a small frying pan adding a 3 tablespoons of water, cook until slightly golden, and water has evaporated (watch that it doesn't burn). In a medium frying pan add 2 tablespoons of olive oil, add mushrooms, oregano, parsley , salt and 1/4 cup of water, cook on medium heat until tender and water has evaporated, stirring occasionally , watch that they don't burn. Then add the drained peas, Italian sausage (break into smaller bits if too large) and combine well. In a medium large pot melt butter over low heat, then blend in the flour and salt, gradually stir in milk , cook and stir constantly over medium heat until mixture begins to bubble and thicken, remove from heat. In a medium baking pan (I used a 12x10 inch / 30 x 25cm) spread a ladle (using a 1/2 cup ladle) of sauce on the bottom of the pan (keeps the noodles from sticking) then doing 3-4 layers , place lasagna noodles (or strips) on top (I used 4 for every level, 1 noodle break in half length wise to fit the pan if need be), add 1 1/2 to 2 ladles of white sauce (spread so that it covers the noodles), 1/4 of the mixture spread on top, 1/4 of the chopped mozzarella, and a 1/4 of the grated parmesan cheese for 3-4 layers. Bake in 350° degree oven for approximately 20-25 minutes, broil for approximately 3 minutes until top is browned. Let sit for 5 minutes before cutting . Enjoy! 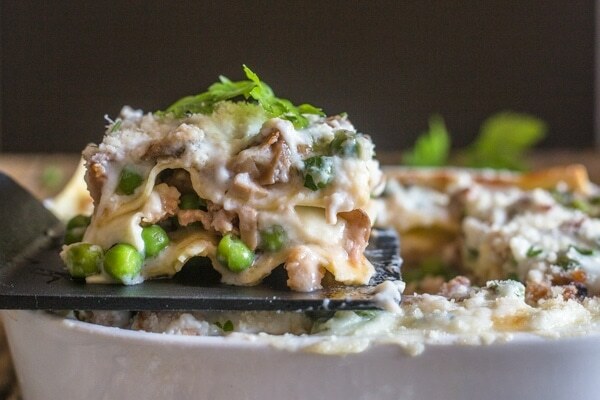 **You could always make this into a vegetable lasagna, increase the peas and mushrooms and leave out the Italian sausage. Updated from January 27, 2014. Very interested in this for a women’s Christmas luncheon. I would need to premake and freeze. Have you ever frozen it before cooking? I’m concerned that the white sauce would separate….thoughts? ?….thanks so much!! Hi Gail yes you can freeze it before baking, my niece does it all the time and it never separates. Hope that helps. And I hope you like it. Thank you for coming up w a WHITE sauce lasagna!!! I’ve tried with different white sauces I’ve made before but the taste was off. Cant wait to try this next. I cant wait to see how we love it. Your welcome, and I hope it’s the one you have been looking for. Let me know how it goes. 1) Are you supposed to cook the noodles first? I made it according to the recipe and the noodles were still practically uncooked. 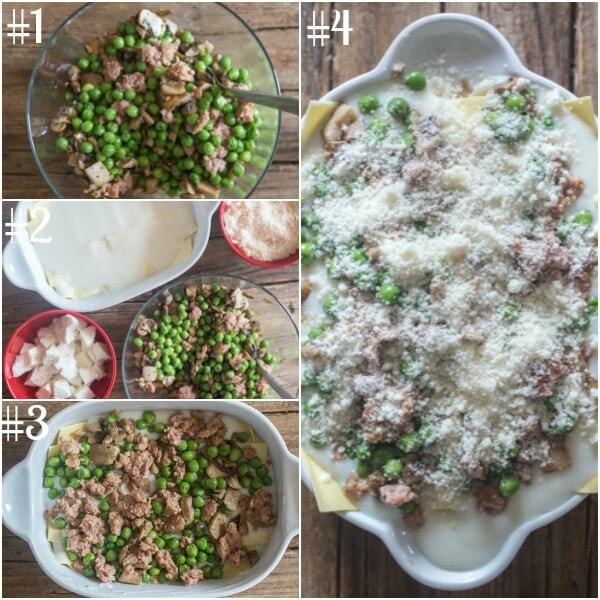 2) Only 3 & 1/2 cups of white sauce for a full lasagna? Is that a typo? I feel like you need at least twice as much, That’s barely enough for 2 layers. The idea here seems good and the flavors are great, but the actual recipe execution doesn’t seem to fit. Hi Cam, it depends on what type of noodles you use, if you use the strips then those ones don’t need pre cooking (check the box). That should be enough sauce, a sauce should complement the dish not drown it. Make 3 layers rather than 4. Divide the mixture between the 3 layers. I have been making this for years and it works. Hope that helps. Can I bake this a few hours ahead of time and reheat for my guests? Would like to be able to clean up the kitchen before everyone arrives ! Hi Vanessa, why don’t you clean up the kitchen and then bake it before everyone comes? You could re heat it at a lower temperature if you want (around 300F / 150C). Let me know how it goes. Is that 1 1/2 CUPS of mozza cheese? Hi Carol, no it’s 1 to 1 1/2 large fresh mozzarella balls chopped (small). Hope that helps. hi. what milk should i use? fresh milk? Hi Zj Jamz I always use 2 percent fresh milk. Hope you enjoy it. Cant wait to taste this! Hi Leslie, great, I hope you enjoy it. Hi Karyl, thanks it is definitely one of our favourites. Let me know how you like it. Where is the garlic in this recipe? How can you cook Italian food without garlic? I will use your recipe, but will definitely be adding garlic to the white sauce. Would you please say how many fluid ounces in a cup or half acup? Thank you. Hi Lynne there are 8 fluid ounces in a cup. Hope that helps. I just came across this recipe and it looks so scrumptious! I am not a fan of Italian sausage though. Do you have any suggestions on what would be best to use for a substitute (pork sausage, beef? ), and how much to use. Thank you! Hi Wanda, thank you and you could certainly substitute with pork sausage, that would work perfectly. Let me know how you enjoyed it. This looks delicious! My husband is not a fan of peas, any ideas for a substitute? Hi Gina, how about broccoli or green beans (chopped small pieces) maybe even try zucchini (if using zucchini don’t boil it sauté it with the mushrooms. Let me know what you choose and how it was. Have a great weekend. I like it here, my second pea fest 😉 I have never heard of white lasagne but it looks and sounds wonderful… I make a ‘carbonara’ style dish with peas, smoked ham hock that sounds almost similar in some ways but love the indulgence of this! Definitely pinning for later. 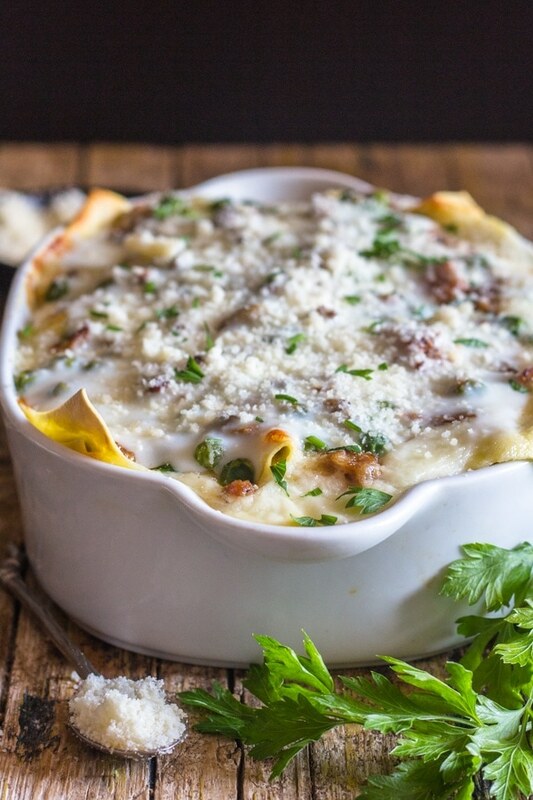 I’d gladly wait for you to come and make it for me 🙂 But seriously, I’ve never made a white lasagna, but this looks so delicious, I think I need to. Hi Renee, seriously give it a try, a delicious change from the classic. Hi Anna, Thank you very much, I do enjoy living in Rome and yes it does take getting used, being from Canada I miss it all the time too, so I understand how you feel. Hahaha! Or are you going to wait till I come to make it? Seriously make it , it is really good if i do say so myself! I’ve had the pleasure of eating this dish when I was in Italy visiting my aunt Rosemary. I’m not a major foodie, so food isn’t something that I give extra thought too. However in Italy, that goes out the window. Even more so, with Rosemary’s dishes I can’t help but become enamored with food. It’s one of those standout, memorable meals. Much like most of her cooking. Make it, you won’t be sorry. It’s freakin’ delicious! Thanks Audrey, glad you liked it, I made it on Sunday and they even asked for seconds.